In this article we are going to create 3D pictures with an interesting software tool. Which one? We will create 3D objects using Lego box of bricks. And then we create Lego anaglyphs. 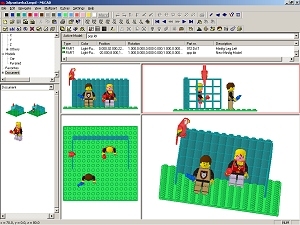 To create a Lego picture we need a specialized software. There is a lot of different Lego software, we've tested them and choosen LDraw software - you can download it from this page. (You can find the link to this program on our download page for members - and we update it there when necessary). Download the software and then install it. You can choose basic installation which installs MLCad, LDView and a few important components. Start MLCad and set the aplication directory (in most cases it will be OK when you delete Apps/MLCad from the offering; write the application directory to a paper - you will need it later). Customize the user interface and start working. Now you can choose your first Lego brick (in the left upper corner there is a list of libraries with different Lego parts - if you choose one then you can see all it's part in the left bottom corner). Take the brick and move it to one of four windows in the right bottom corner. These windows show different views to the scene - from top, left, front and a camera view. You can place bricks one on the other, one behind the other one aside the other... To make your work easier we recommend to place a baseplate as your first brick and then build everything on it. You can choose for example the 16 x 16 size base. In libraries you can find a lot of different simple and more complicated objects - for example a bird (in the library Other Parts/A). You can create a figure as well. Just click to a button with picture of a head. You will see a new window - with a figure - and you can set it's parameters. For example the hat parameter allows you to set hairs or hat properties. You can choose hand accessories as well etc. To insert the figure to your scene choose - New sub model and OK. Then choose in the list (on the left side) Dokument. In the left window you should see the figure and your scene. Before you put the scene and the figure together, we recommend to connect all it's parts - (select the figure and choose Edit/Group/Create). Then place the scene on the figure; you should be able to move with the figure as one object later. If the new scene is bigger than a window, you can use the right mouse button and choose Zoom/Fit. If you use the mouse in the right bottom window, the scene could be shifted, rotated etc. When you finish creating of your scene save it - use File/Export (standard parameters should be OK). Now use the second installed software - LDView. You should insert the installation directory here (use the same as for MLCad) as well and then you can start working. In LDView you can see your scene in a good quality from every angle. If you need to see your scene from the front view then choose View/Viewing Angles - Front. To create an anaglyph just choose Edit/Preferences - Effects - Stereo/Parallel. Set the optimal shift of views (we recommend to choose not too big shift - we often placed the rod to the first line from the left). Save the image (or place it to the Windows Clipboard - use the Print Screen key) and make 2 images (the left and the right one) from it in your graphical editor. And then create an anaglyph from them in 3DJournal software. (You can load the picture saved from LDView directly to 3DJournal software as the left and right picture as well - and then use a big horizontal shift). If you are interested in 3D animations - as described in this article then you can try to create an animation with the 3D lego software. Enjoy it!